over 800 sq. 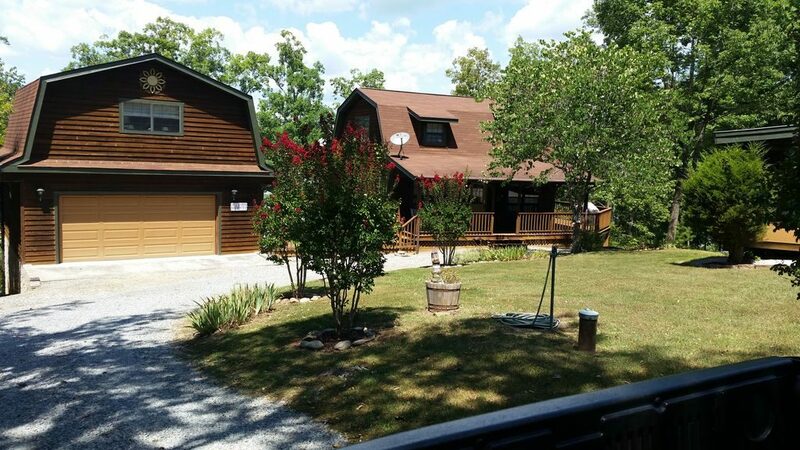 ft. of lake frontage that is available year-round. 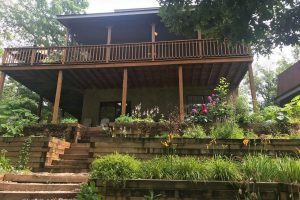 The property features a private dock and private loading ramp. 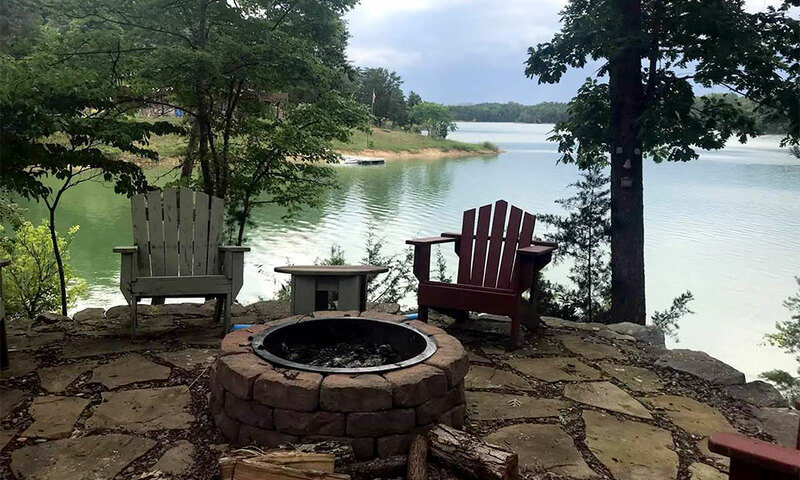 Large, majestic flagstone and pebble walkways stretch all around the property and a beautiful landscape with a very gentle slope to the water makes this the perfect kid-friendly vacation rental. 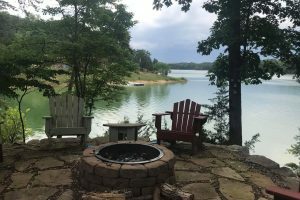 There is a picnic table and also a fire pit right at the waters’ edge. 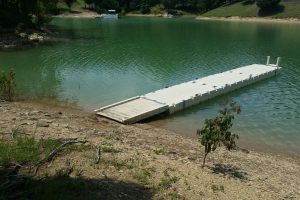 From the house to the dock, it’s maybe 150ft of walking distance. 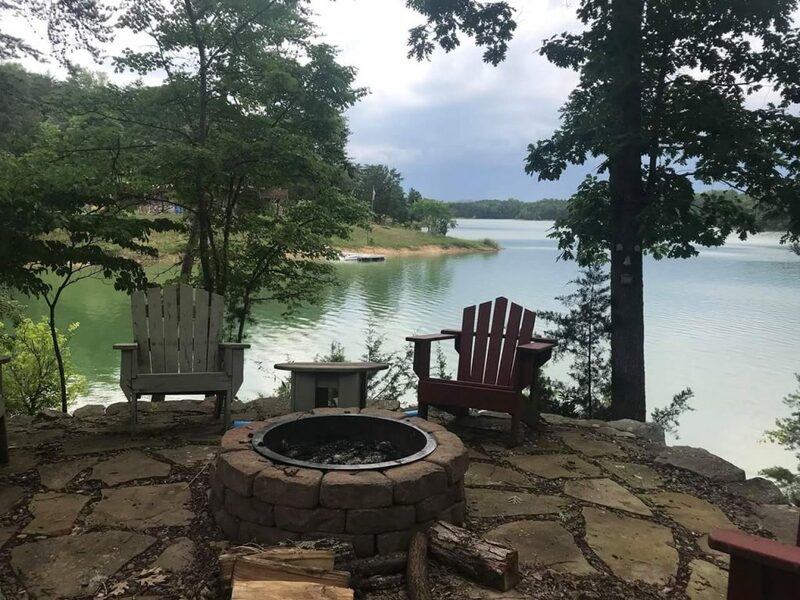 Lots of outdoor landscaped lighting around the house make for wonderful nights spent outside enjoying the lake at night. 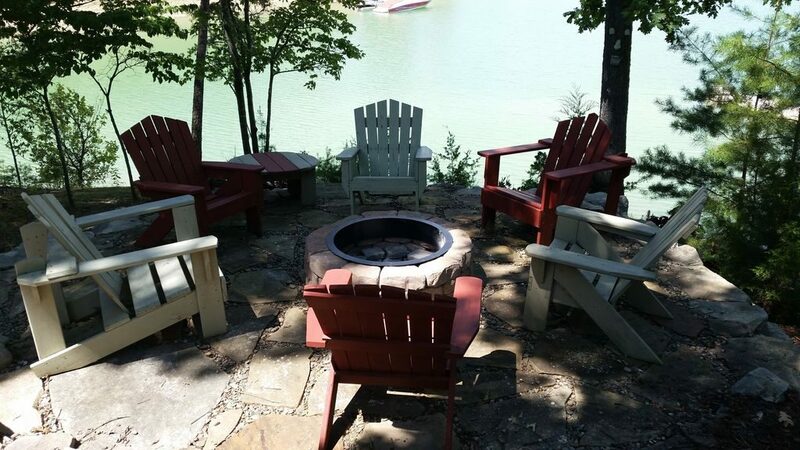 Right at the waters’ edge there is a large flagstone and pebble patio with Adirondack chairs and a 2nd fire pit. 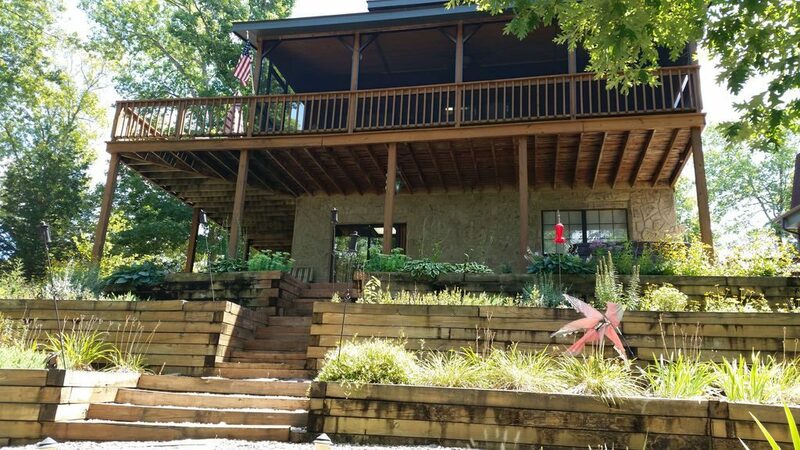 Perfect for enjoying the lake and the views that this property offers! 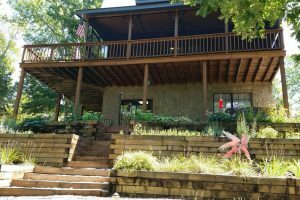 The home has 3 levels and is large enough to spread out big families so everyone has their own space. 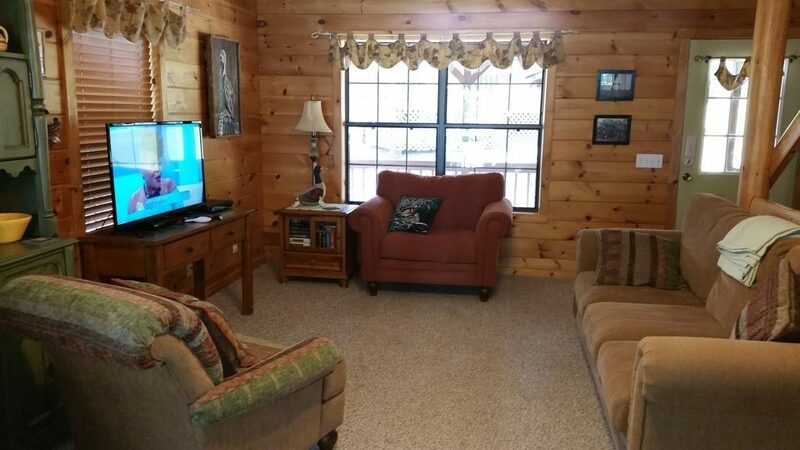 There are 6 large flat screen TVs in the home. 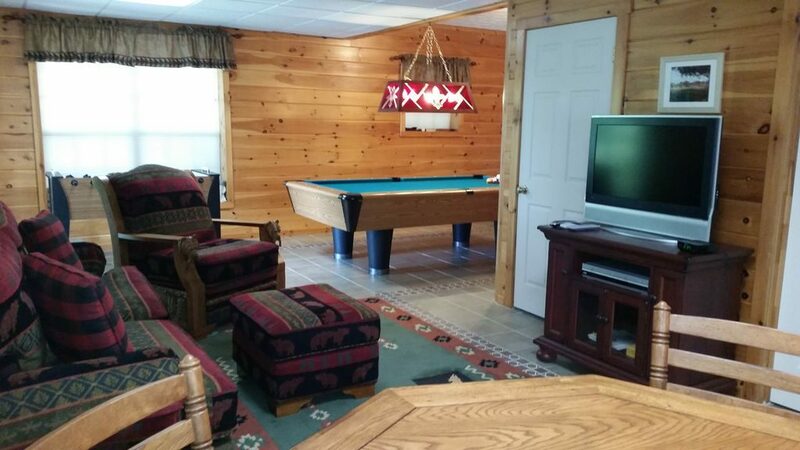 Each bedroom has a TV as well as the den on the main level and also the den area located downstairs in the game room. 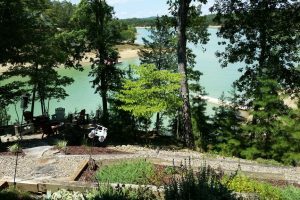 This fantastic lakefront home features 4 bedrooms and 4 baths, one of which is a private suite above the garage separate from the home. 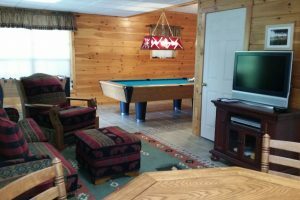 There is also a stereo system in the garage that has speakers mounted around outside so you can enjoy some music while enjoying the outside and also an added benefit of an additional full-size refrigerator for storing extra food and drinks is located in the garage. 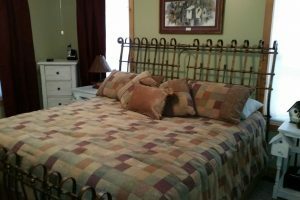 The Master bedroom with a King bed is located on the main level with a private bath. 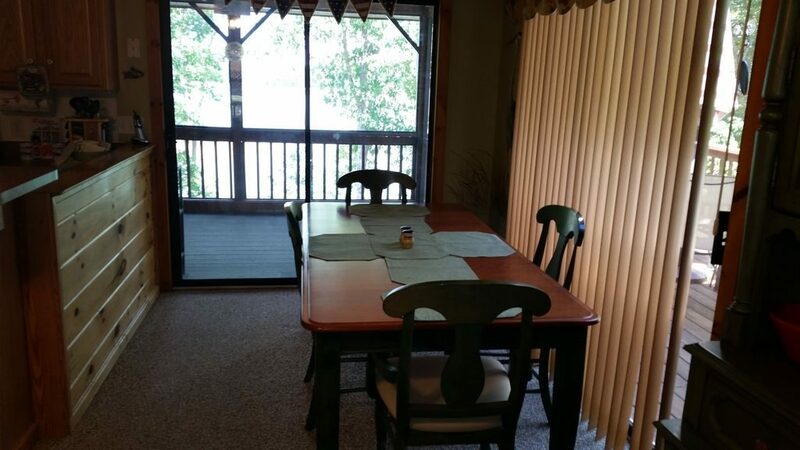 Also located on the main level is the kitchen complete with a dishwasher, bar, 2 stools and a table for 6 all overlooking the lake with great views. 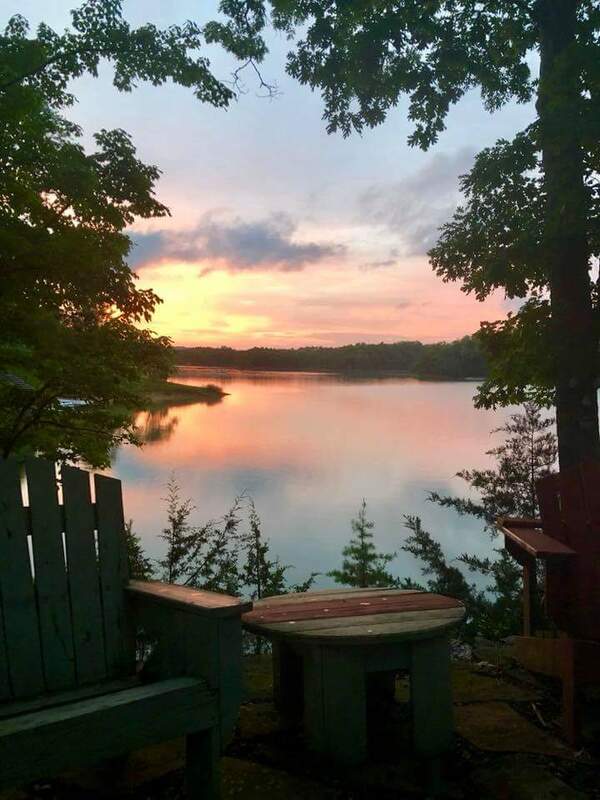 You can sit at the kitchen table and see the kids down at the dock playing. 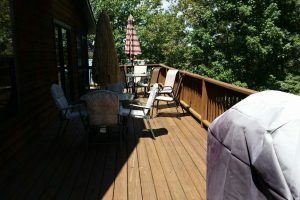 The den is located on this floor as well offering access to the screened-in porch, which is a wonderful space with tables and chairs perfect for early mornings and late evenings enjoying the outside, and also has access to the open-air deck which has a gas grill and lots of porch furniture. 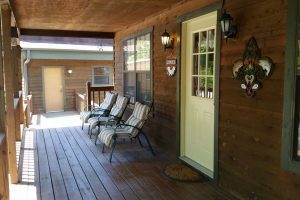 You can also walk right around to the covered front porch complete with some nice, comfortable chairs to just sit back and relax. 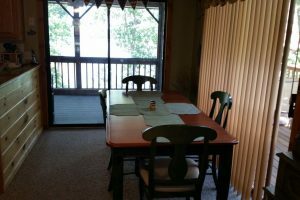 The 2nd and 3rd bedrooms are upstairs. 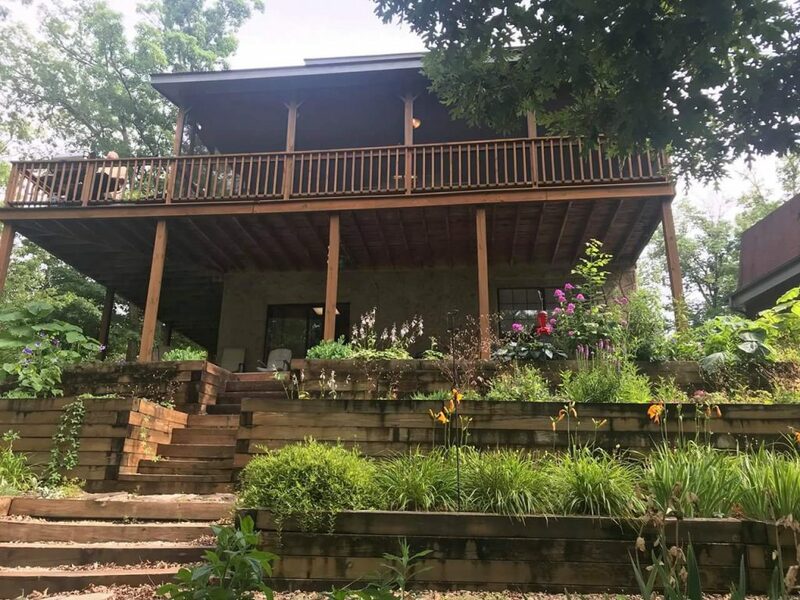 They are a King bedroom and a Queen bedroom, respectively, and one of the bedrooms has a private balcony that overlooks the lake. 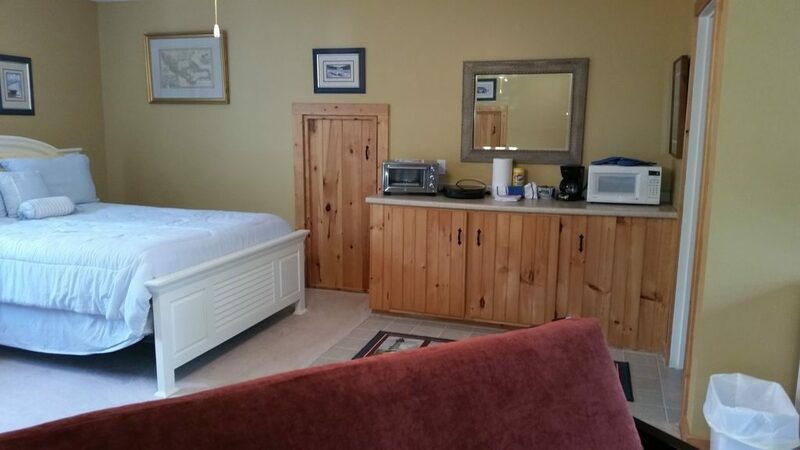 These 2 bedrooms share a bath. 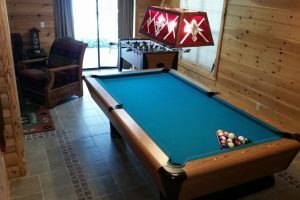 The basement level of the home is a game room and small den area complete with a pool table, foosball table, card table, lots of books for reading and some other fun board games, full bath and laundry room. 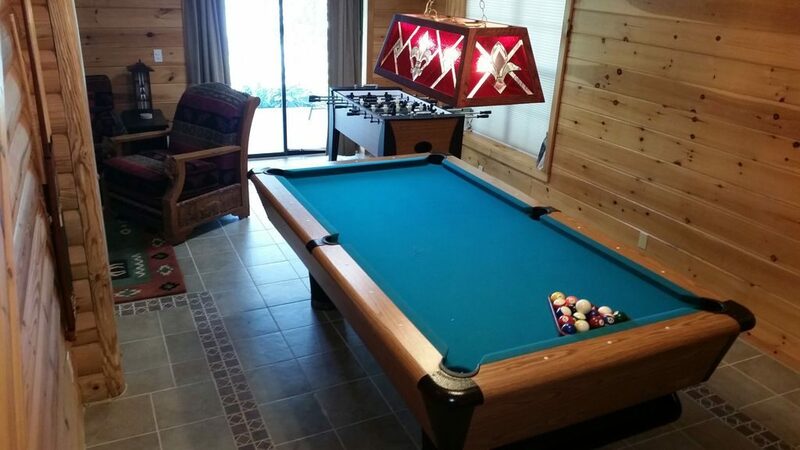 There is also a full-size futon sleeper and a Queen-size sleeper sofa. 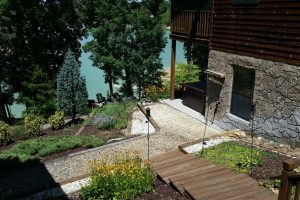 This lower level of the home walks outside to a fabulous concrete patio with a brand new large hot tub overlooking the lake and fire pit. That will make for some great times as well. 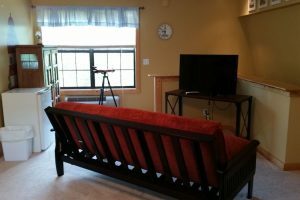 The 4th bedroom is located in an apartment-style dwelling above the garage separate from the home. 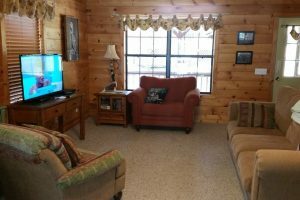 This is ideal for older teens or a couple looking for added privacy. 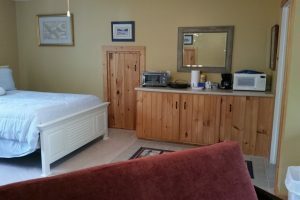 The bedroom has a private bath and 2 Queen beds, a sitting area that has a full-size sleeper futon couch, and a kitchenette area complete with a fridge, microwave, toaster oven, hot plate with 2 eyes, coffee pot and some cooking and eating utensils. 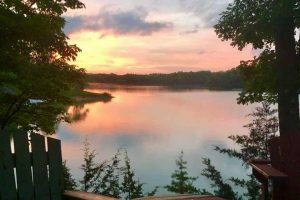 Call for special pricing for couples’ getaways and small family vacations as well. 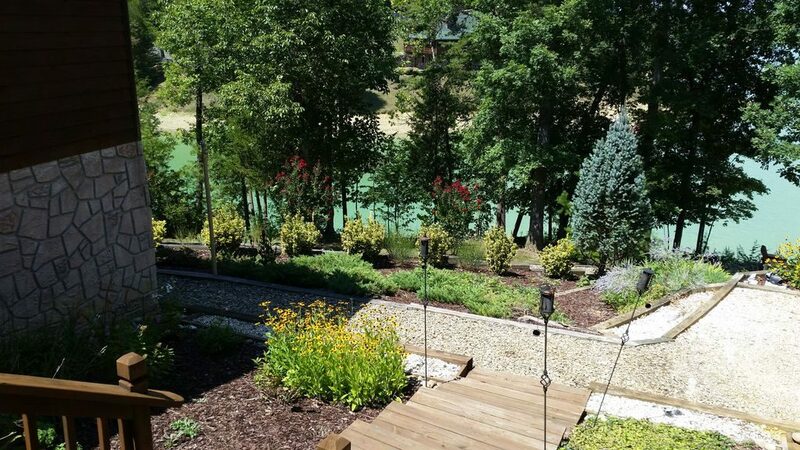 The views from this home are fantastic and the property is one-of-a-kind. 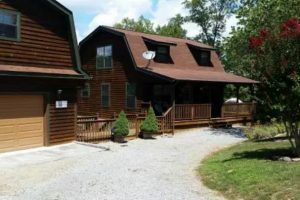 This home and property will make for some great family vacations with memories to last a lifetime. 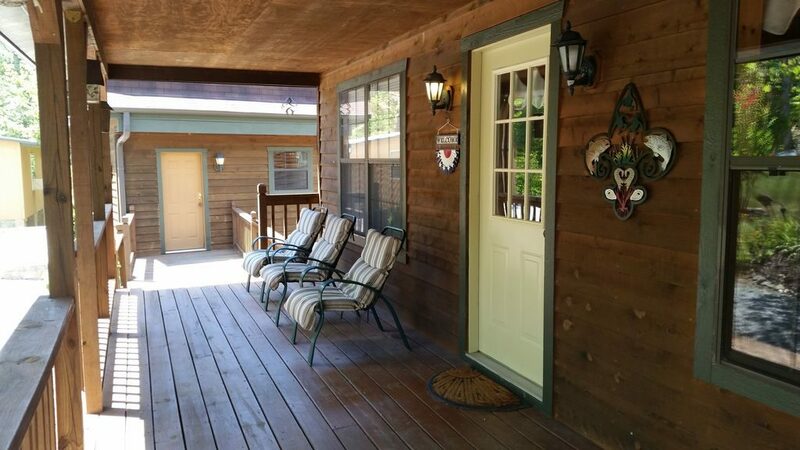 Also, this home is only about 15-20 minutes to Pigeon Forge and Gatlinburg, and 10 minutes to a grocery store or sit-down restaurant in Sevierville. 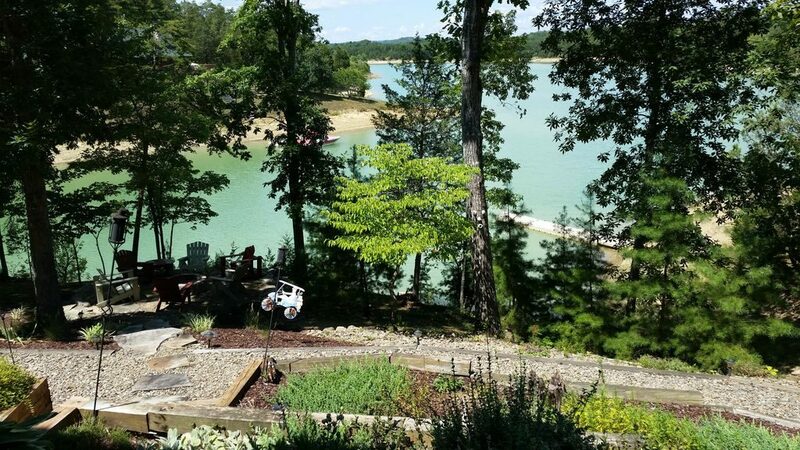 Come enjoy all that Kajun Kove has to offer! You won’t be disappointed! 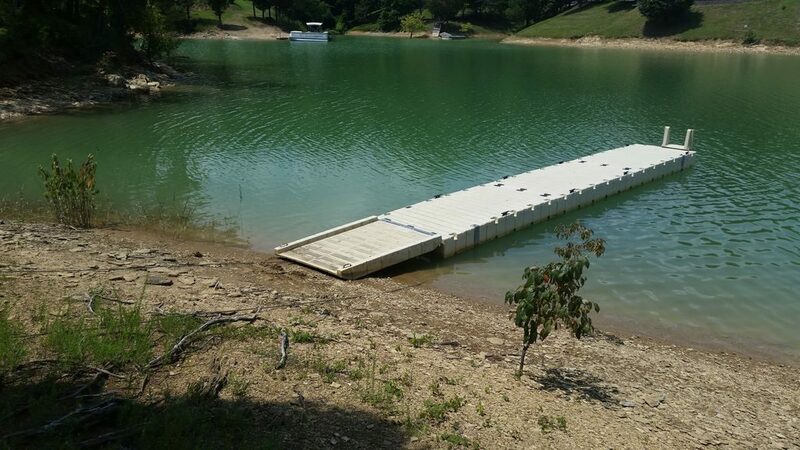 • Year-round loading ramp Sevierville side of the lake (South side). 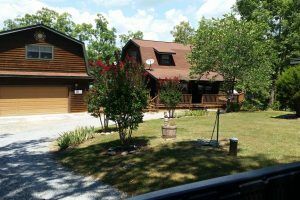 • Flat Creek area of the lake 10 minutes to town. 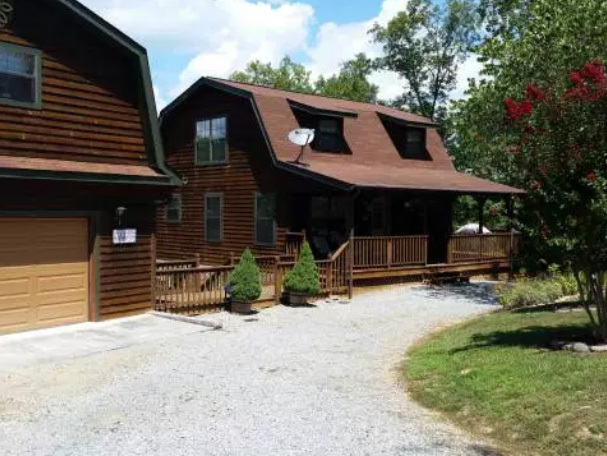 • 15-20 minutes to Pigeon Forge and Gatlinburg. • 1 King bedroom upstairs. 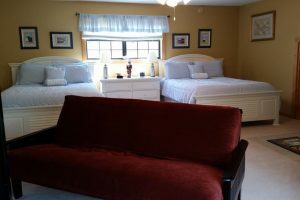 • 1 Queen bedroom upstairs. 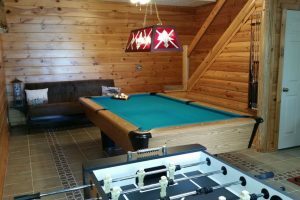 • 1 Queen sleeper sofa lower level game room. 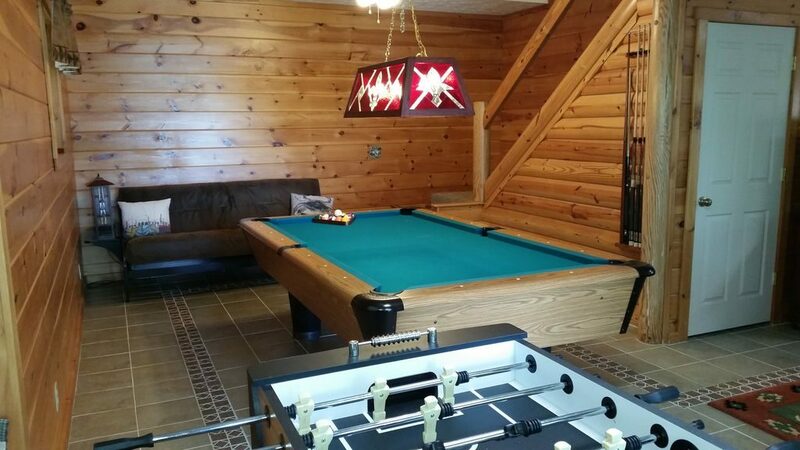 • 1 Full size sleeper sofa lower level game room. 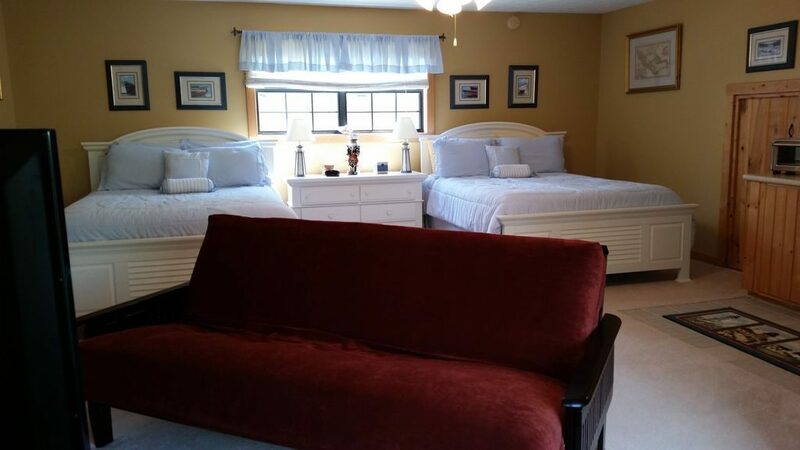 • 2 Queen beds in an open bedroom floor plan upstairs above the garage. 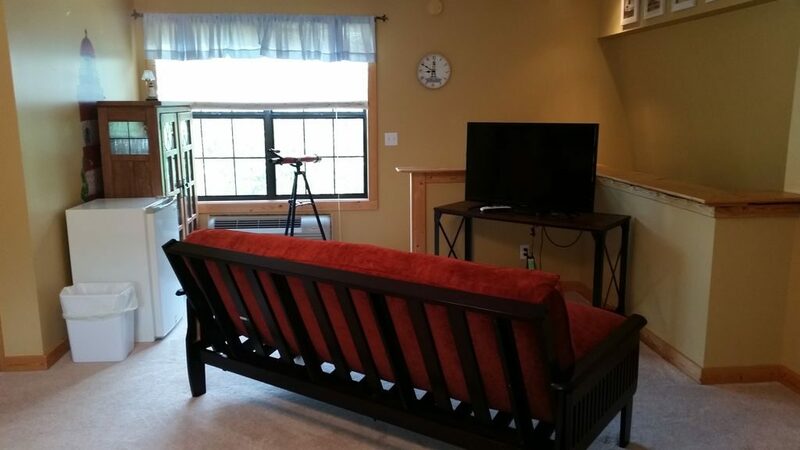 • 1 Full size sleeper sofa in bedroom above the garage. 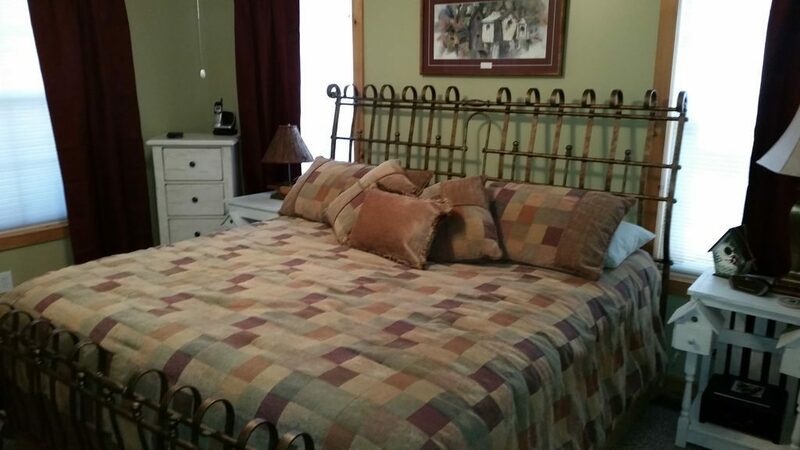 • 1 full bath main level Master suite. 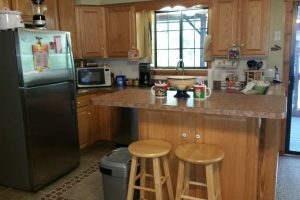 • Stove, refrigerator, dishwasher, microwave, toaster, blender and coffee pot. 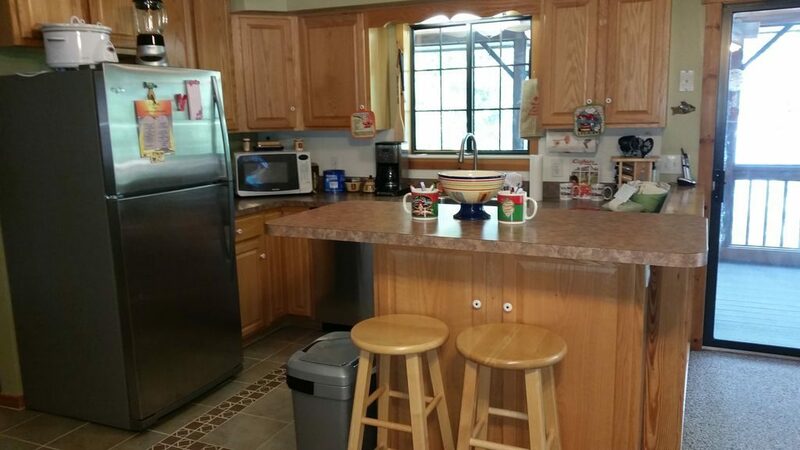 • Kitchenette in apartment bedroom with small fridge, microwave, coffee pot, hot plate, toaster oven and utensils. • Full-size refrigerator in garage. 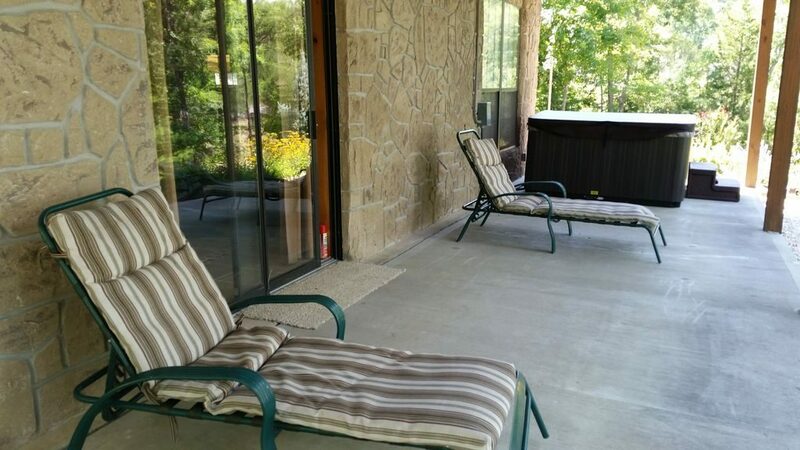 • Stereo system wired with outside speakers for outdoor entertainment. 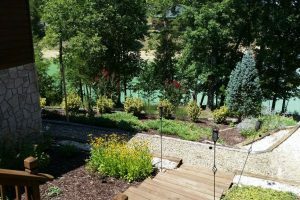 • Gentle slope to the lake. 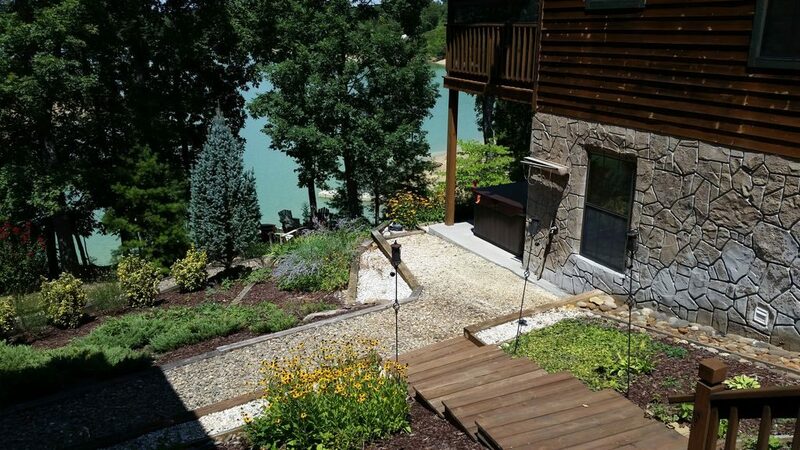 • Private balcony off upper floor bedroom overlooking the lake. 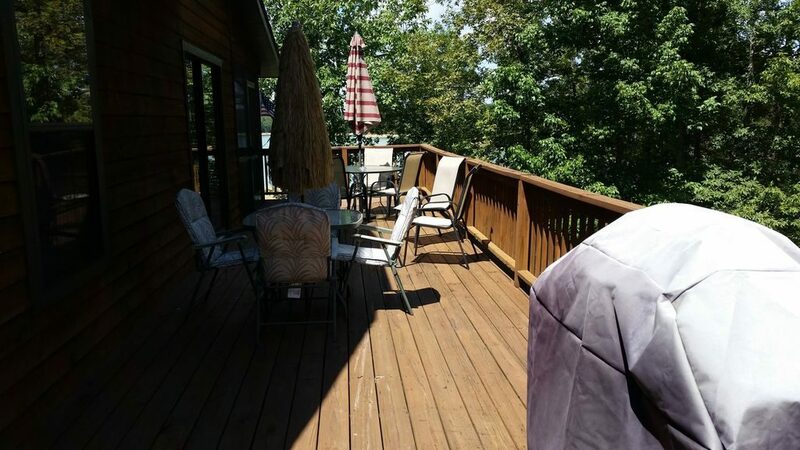 • Screened deck overlooking lake. 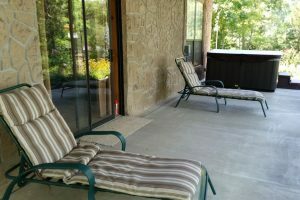 • Concrete patio on lower level of home. 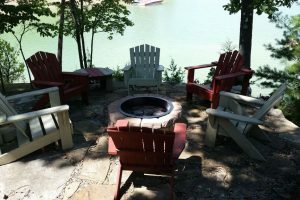 • Plenty of patio furniture.